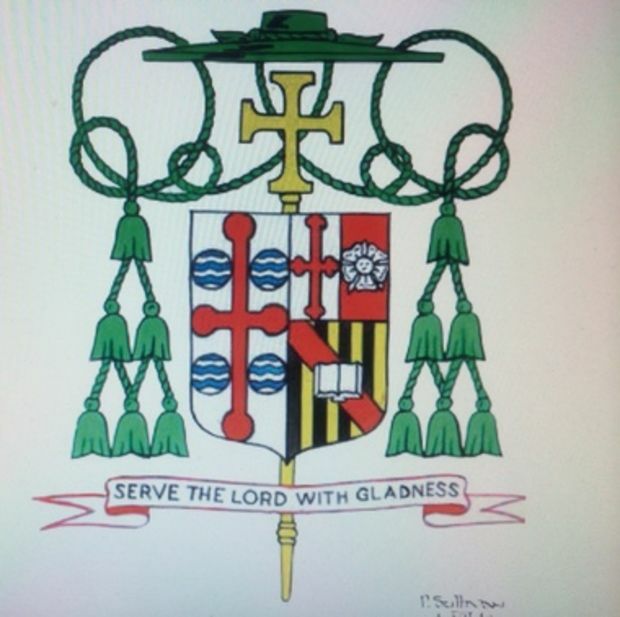 His personal arms (below) were assumed in 2004 at the time he became a bishop when he was appointed as Auxiliary in Baltimore. The small cross is symbolic of St. Michael (a name from which Mitchell is derived); the red and white colors allude to the national colors of Poland; the flower alludes to his surname which, in Polish, means “rose flower”. 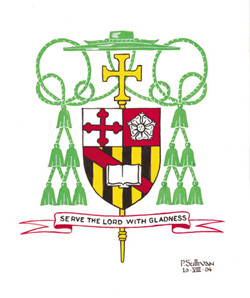 The lower portion uses the colors derived from the arms of Calvert, Lord Baltimore. The red bend (vertical stripe) and open book are for preaching the Word. The motto is taken from Psalm 100. This entry was posted in Bishops, Work of Other Artists on August 11, 2014 by guyselvester. Do you know who created the wood carved coat of arms for Bishop Rozanski which was placed over the cathedra in St. Michael’s Cathedral? If so, could you let me know at Robert.Hughes@camdendiocese.org. Thanks.